Aquatic turtles need the water they live in to be of the proper temperature in order for them to live. If the water is too cold, they will get sick. But if the water is too warm, they may not come out to bask enough, which can also make them sick. Your turtle needs the water temperature to be right in order to survive and be healthy. Like all reptiles, turtles are ectothermic (or "cold-blooded") animals. That means they can't control their body temperatures. Their body temperatures are the same as the air and water around them within a few degrees. And like all animals, they need their body temperature to be in the correct range for their biological processes like respiration, digestion, metabolism, and resistance to disease to work properly. That's why controlling the temperature in our turtle habitats is so important: We're actually controlling our turtles' body temperatures when we control their habitat temperatures. Luckily, heating the water in our our turtles' habitats is actually pretty easy to do, once you know how. The first thing you need to know is what temperature your particular turtle species needs at his or her stage of life. You can find this out by looking at the care sheet for the species of turtle that you have or that you plan to have. 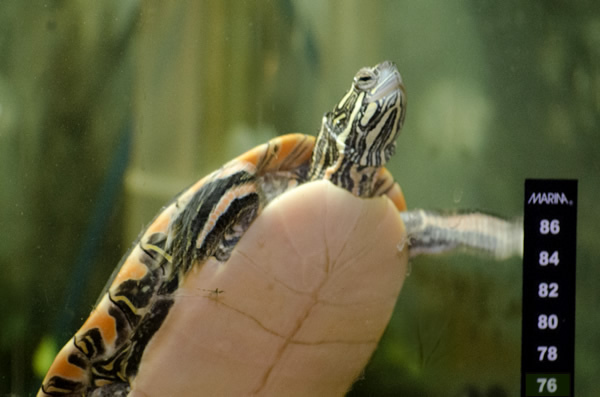 Austin's Turtle Page is a great resource for all kinds of information about turtle care, and they have a whole section devoted to care sheets for different kinds of turtles. So check out the care sheet for your kind of turtle to see what kind of air and water temps it likes. Most of the more popular aquatic turtles like Painted Turtles, Red-Eared Sliders, and Musk Turtles do well with a water temperature of about 78 to 82 degrees Fahrenheit (26 to 28 degrees Celsius) when they are hatchlings. Once their carapace (upper shell) is about 1.5 inches (3.8 centimeters) in length, the temperature can be gradually reduced, a degree or so every few weeks, to about 74 to 76 degrees Fahrenheit (23 to 24 degrees Celsius). Turtles who are sick need higher temperatures than turtles who are well. Because turtles are ectothermic animals, they can't run a fever when they're sick; so we have to raise their habitat temperatures a little to do that for them. In general, a sick turtle's air and water temperatures should be raised about four degrees Fahrenheit (about 2 degrees Celsius) from it's normal preferred temperature. The easiest way to maintain the correct water temperature in a turtle tank is by using one or more aquarium heaters. These are commonly available in pet supply stores, but you have to be careful to choose the right heater. There are two things that you have to consider. The first thing you have to think about is that the heater you choose should have an outside covering made of metal or thermal-resistant plastic, not glass. This is because turtles are bigger animals than fish and they have hard shells that can break the glass tube of an aquarium heater. If that happens, your turtles will probably be electrocuted and die. If the room where your turtle tank will be is very cold, then you should use more-powerful heaters than the ones listed above. If it is very warm, you probably can use less-powerful ones. If you use two or more aquarium heaters to heat your turtle tank, then you should add up the wattages of all the heaters. They should should total at least the amounts in the chart above for the amount of water in your tank. Submersible aquarium heaters must be mounted an inch or so (about 2.5 cm) below the lowest level to which the water will ever drop due to evaporation. If the heater is operated without water around it, it will instantly burn out. Also, make sure to turn off your heater(s) when doing water changes if the water you're removing will cause the level to drop below that of the heater(s). Because heat is so important to turtles, using more than one heater is a very good idea. If one stops working, the other will prevent the tank from getting really cold. (You should still replace the broken one as soon as possible, though). Having multiple heaters also helps keep the water temperate more even throughout the tank and may extend the life of the heaters. I recommend that you use only non-glass aquarium heaters like the Aqueon Pro series. If you must use a glass heater, then make sure to buy one that has a tough outer plastic cover. The reason for this is that turtles are heavy animals with hard shells who can easily break a glass heater and get electrocuted. I also recommend that you buy one with adjustable temperature settings. There are times you may want to raise or lower the water temperature. Ideally, you should buy a heater that has a range of at least 73 F (23 C) to 85 F (30 C). Adult, healthy turtles who are native to cooler, temperate climates will do fine at the lower end of that range; species native to the tropics will be more comfortable toward the middle; and hatchlings and sick adults will appreciate them temperatures near the top. One more thing: Don't make your turtle's water temperature too warm. For most adult aquatic turtle species, 78 F. (25.5 C.) is the highest you want unless you're treating them for an illness and a veterinarian has told you to raise the temperature. Otherwise, too-warm water can encourage bacteria growth in the tank. It also discourages turtles from basking sometimes. If you don't want to use heaters inside your turtle tank, then you may want to consider an in-line external aquarium heater like one of the Hydor models. These heaters are installed outside the tank (never inside the tank) in the output line of your external canister filter. If you're not using a canister filter, then you can use an aquarium water pump to provide flow through the heater. Either way, the heater warms the water as it passes through the heater. If you decide to use an external heater, make sure to order one whose wattage is sufficient for your tank, whose fittings will fit your filter's hoses, and which is rated for flow rates at or above your filter's (or pump's) water flow. If you're not using a canister heater and need to use an aquarium pump to provide flow to an external heater, be sure read the pump's instructions carefully. Many aquarium pumps are water-cooled and must be installed inside the tank or else they will burn out. Other pumps must be installed outside the water or else they will electrocute and kill everything in the tank (and maybe you, as well). Some pumps can be used either way. Make sure to read the instructions for your pump and install it properly. Like any other aquarium heater, external heaters will burn out if they're operated dry. So once you install them, start the filter or pump and make sure that water is flowing through the heater before you turn it on. If you don't, you will be buying another heater. Thermometers are essential for all turtle habitats. We need at least two: One to measure the temperature at the basking area, and one to measure the water temperature. Most turtle keepers use aquarium thermometers because they're easy to find and do the same thing. But just as is the case with heaters, avoid any kind of glass thermometer in a turtle tank. The turtles may break the glass and get seriously injured. Personally, I still like the stick-on LCD thermometers. They're inexpensive and easy to read. There are two different kinds, however, so make sure you use the right ones. One type is for water temperature and gets attached to the outside the tank to indicate the temperature of the water behind it. The other type is usually used for terrariums and is reads the air temperature. The thermometers for the air temperature are usually found in the reptile departments of pet stores, and the ones for the water temperature are usually found in the fish department. Make sure that the air temperature thermometer is a "high-range" one that can display temperatures at least as high as 95 degrees Fahrenheit (35 degrees Celsius). The water temperature thermometer should be able to display temperatures from 73 F (23 C) to 85 F (30 C). Under-Tank Heaters, Rock Heaters, etc. Most pet supply stores sell a wide variety of heaters that fit under a tank, or which are shaped liked rocks and go inside the tank. I don't recommend any of them. They're designed for terrestrial reptiles, not aquatic turtles. In my experience, the under-tank heaters are expensive and useless for regulating water temperatures, and the rock heaters usually can't be used underwater.